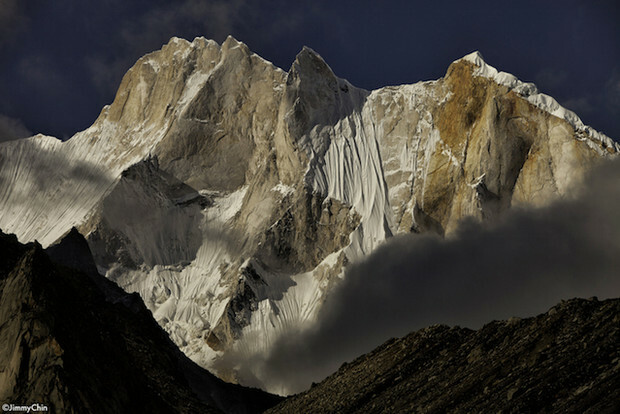 Conrad Anker works his way up the infamous Shark's Fin on Mount Meru in Northern India. Jimmy Chin/Meru Film photo. Just hours from the summit, and after nearly a three week climb, with just one week's supply of food, Jimmy Chin, Conrad Anker, and Renan Ozturk abandoned their mission and turned around. In 2008, the Shark’s Fin summit of Meru had yet to be claimed and hosted an impressive list of failed attempts by world-class climbers from around the world. “The ultimate test for the master climber,” Meru has gained notoriety as the final, albeit deadly, stomping grounds within the small and highly selective community of high alpine big wall climbers. The Shark’s Fin boasts Everest-like conditions, with an El Cap-comparable climb on top of it… and no Sherpas to carry your gear, or set lines to rely on. We sat down with Jimmy Chin to try and get a better handle on the who, what, where, when, how and most importantly, why, they set their sites on Meru. This is the first of a three part series on excerpts from our interview about Meru, the film about the mission which premiered nationwide today. "After suffering dramatic set backs in their lives," the film's synopsis reads, "Three close friends who are among the world’s best professional climbers battle their complicated pasts, inner demons and nature’s harshest elements in an attempt to confront the Shark’s Fin on Mount Meru, the most technically complicated and dangerous peak in the Himalayas, one that has never been scaled to completion." Hillary/TGR: Jon Krakauer calls Meru the anti-Everest, but also the test for the master climber. Do you agree with that? It's like El Capitan... minus all the "conveniences." Jimmy Chin/Meru photo. Jimmy: Kind of. In a way it is the antithesis of Everest. It’s not the highest peak by any means. There are no sherpas carrying your stuff. Only a really small core community of alpine climbers, like big wall aficionados, would know about Meru. But within that community, it’s notorious. RELATED: Inside Jimmy Chin's 20,000ft Basecamp. There have been at least 25 expeditions that have gone there and failed. And they were not random people showing up. They were the best teams in the world from Russia and the UK, Spain, the U.S., and Japan teams. There were a lot of teams that attempted the route. And the more failures you have on the line, the more intriguing it becomes. Why return to Meru in the first place? The Shark's Fine is the middle, shaded peak on Meru's knife-edge ridgeline. Meru photo. What prompted us was actually this guy named Silvo Karo–he’s this legendary Slovenian climber who’s done some of the gnarliest alpine big walls in the world. And he asked us about it in 2008, and we gave him all of the beta. Cause we were like okay, cool. In a way it was an honor because Silvo only goes and picks the biggest and baddest lines to climb. So we thought "Great, hopefully he will get it." We were kind of banking on that. But when he didn’t get it, it was kind of like "Alright, it’s still open and up for grabs. We should go get it. We need to go back for it." Can you explain that kind of pull to me? That need to go complete something with such a notorious reputation and such a high profile roster of failed attempts? 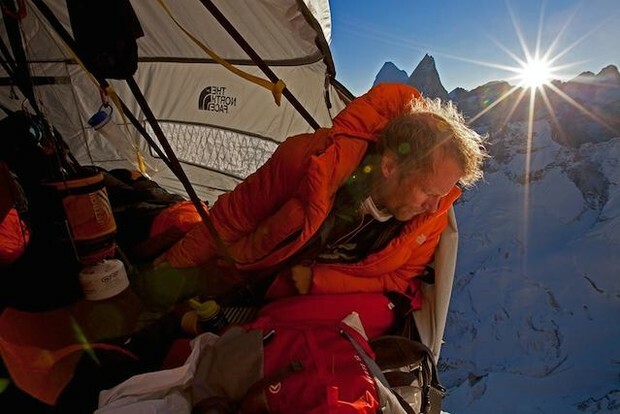 At 20,000 feet, it's the most comfort Conrad Anker would experience in his time on Meru. 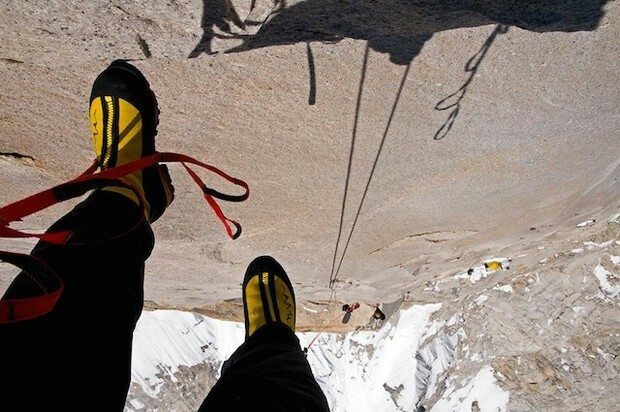 Jimmy Chin/Meru photo. I think, especially, skiers, climbers, surfers–a lot of people who push it and charge in the mountains or the oceans–will probably understand. It’s like skiing a line. You’ve found this line that you’ve been looking at it for years. It’s so inspiring. You know so many of your heroes have tried it and never been able to get it. And you went once and you almost stomped it. It’s probably more like a grand puzzle. We were really close to figuring it out. So I just kind of spent the next few years–it’s just my nature, to solve a puzzle–thinking about all the things we could have done differently. The gear I could have brought and how I could have gone lighter, or maybe I should have brought lighter sleeping bags, would it have been worth it? Next time we could bring these kinds of ice tools and not those. I spent a lot of time, and so did Conrad, and we didn’t talk about it that much, but we were both kind of thinking about solving this puzzle and figuring out how we could do it. Just finding solutions for how to do it better. They say if you’re in this business long enough, you will live to see all of your friends die. Jimmy, Conrad, and Renan successfully atop the Shark's Fin on Mount Meru. Jimmy Chin/Meru photo. Yes. My goal was to show the dangers, rather than talk about them. We were just trying to show what really happened. The other thing that helps, which is unique about the film, was that a lot of other climbing docs have a lot of re-creation and this film is all live action. And that’s just the style of filming. Meru premiered in New York and LA on August 14th to critical acclaim. Check out a full lineup for nationwide premieres for the film here.